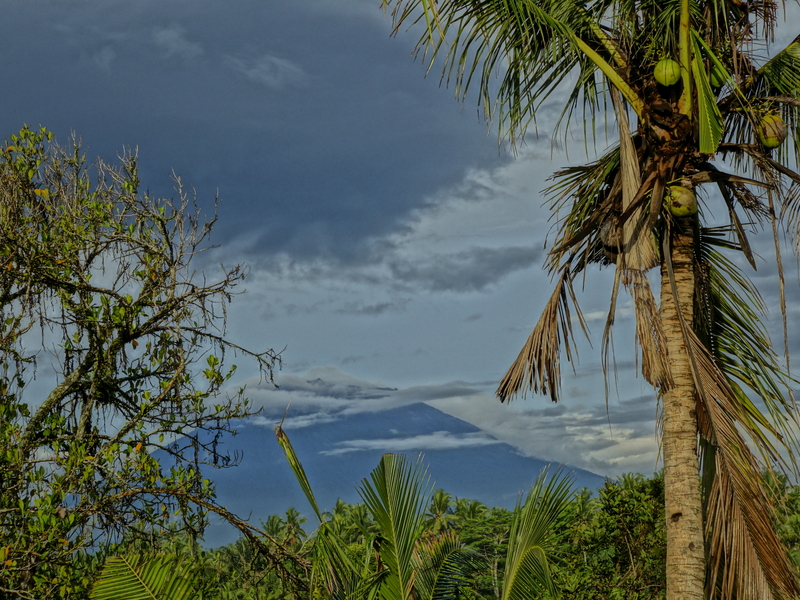 I believe it was Seneca who said that “luck is what happens when preparation meets opportunity.” Not to put too fine a point on things, but I just walked the 40 paces from the yoga shala to Setia Bungalow – my house in Ubud with this view of that volcano – changed out of my yoga clothes, walked 15 steps forward to the massage parlor next door, made an appointment for 5:30 tonight, walked 16 more steps to the Yellow Flower Café, where I am now drinking a hot ginger and about to order breakfast (shall I have the energy smoothy, or the fruit and yogurt, or just go with the eggs and homemade bread?). Making decisions never was easy for me, but here, on the “Island of Gods and Demons,” as the locals like to call Bali…well…I might end up with a chicken satay in peanut sauce for breakfast. Some Westerners are now lopping off the pejorative side of things and calling Bali the “Island of Gods,” meaning perhaps, a heavenly place—which one might agree is true. This has a totally different connotation than the Balinese concept. If you’ve ever seen a statue of a Bali god, you know how gruesome it can appear: pointed teeth, snout, claws. It has to look like that in order to keep that pejorative side of things under control. You don’t send a Pekinese out on patrol with a New York City cop. You need a big dog to run with big dogs. One other bit of luck that I’ve discovered this trip is this: I am allergic to rice fields. When I stay in a house located in a rice field, my eyes itch, my throat burns, and snot runs like the River Jordan. Well, the River Jordan these days is a trickle–there is no Michael rowing no boat ashore. But let’s not nitpick details regarding bodily fluids. The allergy business is sad because rice paddies are magical places. In the jungle areas here, I have no allergic reactions. But, the other side of that story is there are way more insects, and sizes of insects, in the jungle areas. And the insects in the jungle have not cultivated their sense of place regarding tourists. They are much more determined and persistent, and way less trainable. As with most things, you take the good with the bad if you want to keep sane. And if you’re lucky, you’ll be prepared for what happens next. Too bad about being allergic to rice fields. All you write, here and on FB makes me want to go back to Bali. Some more tweaking required – if you click on the name badfish2 above your comment it takes you to the page that has no like button. Weird. I received this when I clicked on my icon on my desktop….so I guess I didn’t delete it!!! Love your blog – I look forward to reading more about your time in Bali. The island has a pulse about it, the soul of the island I feel an instant calm when I arrive (despite the crazy traffic out of Kuta). If I can find a way to live there I will – it has a magnetic pull dragging me back. Ross, I hear you. I come back every chance I get and have just talked with some people about renting their house long-term (1-5 years), which may or may not happen. And right, traffic in Kuta–disaster. But then, these days traffic here is hectic everywhere. It’s about taking the good with the bad, I guess. I just checked out your site…whoa, now that’s a nice blog. Great photos, too. What theme are you using? Where are you now, still traveling? Thanks for the kind words – I think the blog theme is Triton Lite, I like the way the front page is arranged. At the moment back home in Brisbane, Australia – got to work for a while to save the $$$ for our next adventure. I certainly like the way you write and it makes me want to pop over to Indonesia on my next trip east. Luckily I don’t have the rice paddy problem but a few bouts with wild stomach after experimenting with food not properly prepared. Thanks so much for reading. If you get to Indonesia, I hear diving around the island of Komodo is supposed to be awesome. Like everywhere else in the world, food is always an iffy proposition. Bali is truly set up for tourists, though, and I even eat salads there without worry…well, without much worry, as there is always a worry. Nice photos! I can almost feel the jungle … or is it jungle? I know next to nothing about that part of the world. It’s a beautiful country: many outrageous rice fields that go on forever (everyone eats rice, and they also offer it to their gods during many ceremonies, and now, there’s us travelers to feed, too). And some of Bali is mountains, volcanoes really, which formed the land, and are still active. And yes, then there is jungle areas because it rains so much. Thanks for taking a look at my photos! I’ve never seen rice fields, but I think I’ve done with rain forest or rather the bugs!